Great pattern in an atypical fabric is a striking sophisticated geometric that uses prints in a related palette. Six point stars form cubes made of diamond shapes cut from barkcloth. This is the home furnishings fabric popular for mid 20th century upholstery and draperies. Great colors on a forest green background. The backing is a yellow cotton brought around to the top as a wider border on two opposing sides, narrower on the other two. Weathered patina from laundering, yet the fabrics are still incredibly durable. 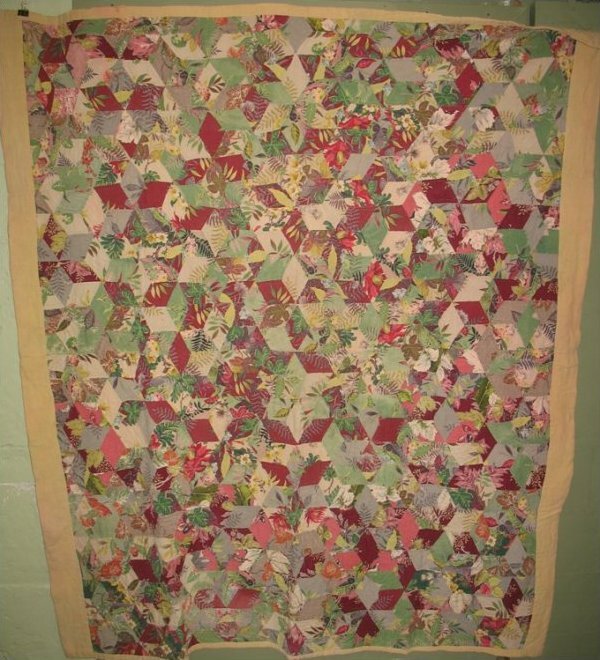 The quilt's perimeter is straight and even, not bowed as it looks in this hasty photo.